On the theme “Strong United Nations. 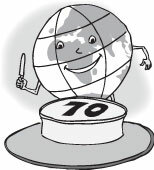 Better World”, the main world body reaches a milestone tomorrow – its 70th anniversary. UN Day marks the anniversary of the adoption in 1945 of the UN Charter. With the ratification of this founding document by the majority of its signatories, including the Security Council’s five permanent members, the UN officially came into being. October 24 has been celebrated as UN Day since 1948 and in 1971, the UN General Assembly recommended that the day be observed by Member States as a public holiday. But with UNGA’s resolutions being non-binding, the day is a global observance but not a public holiday. Some political observers believe it might be a good idea for the day to be observed as a public holiday because it might help strengthen commitment to the UN’s values and virtues, though the world body also has many flaws, faults and failings. UN Secretary General Ban Ki-moon -- who this week made a surprise visit to the Middle East for crisis talks with the Israeli and Palestinian leaders -- in his UN Day message began with a symbolic flag-waving statement. He said “national flags are a mark of pride and patriotism in every country around the world. But there is only one flag that belongs to all of us.” Mr. Ban said the UN’s blue flag was a banner of hope for him as he grew up in wartime Korea. Seven decades after its founding, the UN remains a beacon for humanity. The UN Chief points out that every day, UN-affiliated bodies feed the hungry and shelter those driven from their homes, as they are doing today for several lakhs of refugees in Western European countries. The UN-affiliated bodies vaccinate children who would otherwise die from preventable diseases.The UN defends human rights for all, regardless of race, religion, nationality, gender or sexual orientation, he says. UN peacekeepers are on the frontlines of conflicts, with thousands of Sri Lankan troops also likely to join them after President Maithripala Sirisena held talks with Mr. Ban and world leaders during last month’s General Assembly sessions. According to Mr. Ban UN mediators bring warring parties to the peace table; UN relief workers brave treacherous environments to deliver life-saving assistance. “The UN works for the entire human family of [more than] seven billion people, and cares for the earth, our one and only home. The diverse and talented UN staff helps bring the Charter to life,” Mr. Ban adds. As the UN Chief says, the world faces many crises and the limits of collective international action are painfully clear. Yet no single country or organization can address today’s challenges alone. The UN belongs to all countries, including Sri Lanka, and it is the responsibility of all to ensure that its strengths outweigh its weaknesses. For Sri Lanka, it is the 60th anniversary of our joining the world body and during the past six decades, we have obtained billions of dollars in aid, we have ratified and implemented many of the UN’s conventions and charters for the common good of all. Unfortunately, after 2010, the Rajapaksa regime often clashed openly with the UN and affiliated bodies with some Ministers bitterly attacking UN bodies and officials while one Minister even staged an abortive fast-unto-death. They appeared to be unaware that we belong to the UN and the UN belongs to us also. Even major powers such as Russia and China have not attacked UN bodies and officials as harshly as some Sri Lankan leaders did from 2010 to 2015, largely because of amateurish diplomatic guidance by incompetent political stooges or diplo-muts who were appointed to top posts. Thankfully, the new Government headed by President Sirisena and Prime Minister Ranil Wickremesinghe has taken strong, diplomatic initiatives to work out a new relationship with the UN and the international community. The high point of this transformation was President Sirisena’s visit last month to New York where he held talks with the UN Chief and world leaders. He was also given a place at the head table during an official reception for world leaders, symbolic of the reality that Sri Lanka is now receiving banquets and bouquets, not brickbats from the UN and the international community. To underline this, the President and the Prime Minster will be the guests of honour at the main UN Day celebrations in Colombo tomorrow.